There are lots of products available these days in supermarkets and health shops that are ideal as sugar replacements in sugar free recipes. When using them, it is vital to follow the manufacturer’s instructions, however, and if you have a particular condition or illness, to speak to your GP or medical health advisor. Unless informed otherwise on the product’s own instructions or serving suggestions, use the granulated sweetener at the same stage of the recipe as you would the sugar. When trying out your own recipes you may find it’s a case of trial and error. We all enjoy different levels of sweetness and you may need to experiment to find just the right amount to suit you and those you are cooking for. But none of these recipes are overly sweet, so why not have a go and see how you get on? This is a tasty recipe that is perfect for Pancake Day and ideal for breakfast at any time of the year. Those looking for another no sugar variety could replace the sweetener and lemon with sugar free jam. Beat your eggs in a large bowl. Add milk and sieve flour in. Stir to make a batter. Heat your oil in a non-stick pan until sizzling then pour in enough batter to cover the bottom. When the pancake in golden brown underneath, flip it over. Once cooked, tip onto a plate. Repeat with the rest of the batter. Squeeze your lemons. To serve the pancakes, sprinkle with granulated sweetener and drizzle with lemon juice. In this recipe you’ll find your added sweetener works well with the strong cocoa flavour. Those who like bitter chocolate may wish to reduce the amount of granulated sweetener they add. Preheat your oven to 200 deg C/190 deg F/gas mark five. Put your butter, milk and cocoa powder into a medium pan and melt over a low heat. Place your dry ingredients (including your sweetener) into a bowl. Once melted, stir in the chocolatey liquid. Beat your eggs in a small bowl then add to the mixture. Spoon into muffin cases and bake for about 15 minutes. 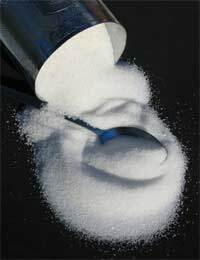 Sweetener can be used in an array of foods and drinks, and enjoyed in moderation throughout the day. This recipe for sugar free hot chocolate makes a great winter warmer in the evening. Mix your cocoa powder and sweetener with a tbsp of cold milk into a paste in the bottom of a large mug. Heat your milk in a small pan, taking care not to boil over. Pour the steaming hot milk onto the paste and stir well. Add a dollop of whipped cream and a sprinkle of dry cocoa powder. Enjoy!